FR. 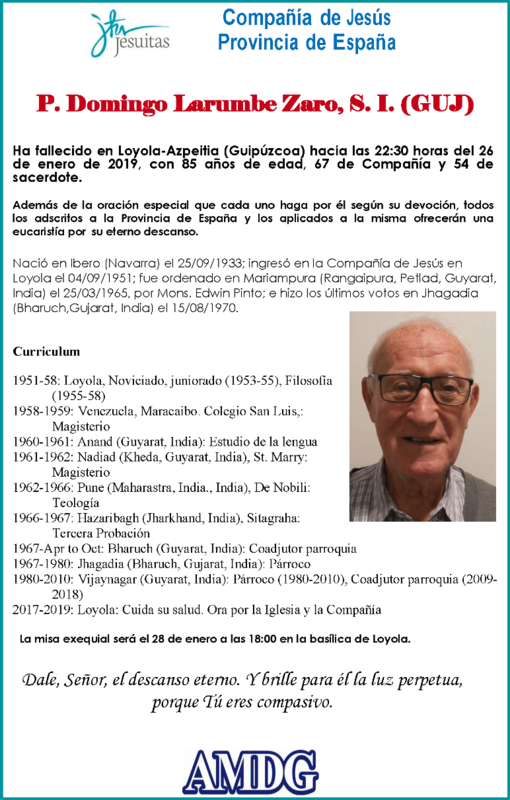 DOMINGO LARUMBE SJ (GUJ ) 85 years old / 67 years in the Society of Jesus, passed away on 26 Jan, 2019 at 10.30PM in Loyola, Spain. 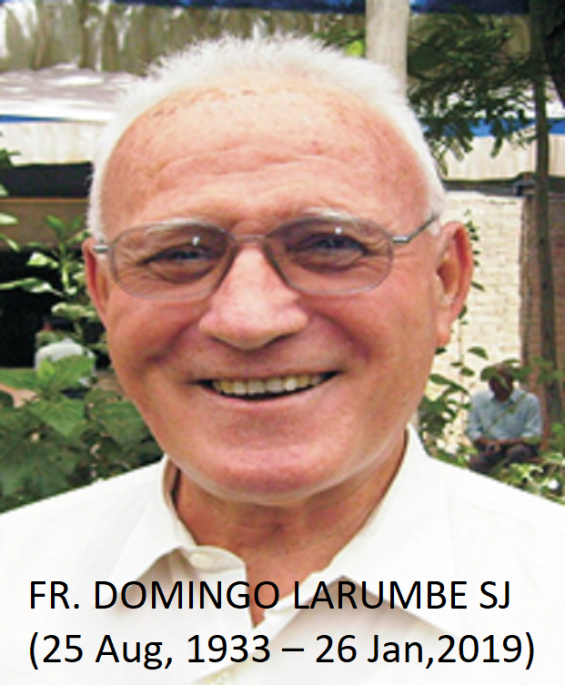 DOMINGO LARUMBE SJ (GUJ ) 85 years old / 67 years in the Society of Jesus, passed away on 26 Jan, 2019 at 10.30PM in Loyola, Spain. The funeral Mass will be held on January 28 at 18:00 hrs in the Basilica of Loyola, Spain. Fr. Domingo Larumbe was born on 25 August, 1933, in Ibero, Navara, Spain. He entered the Society of Jesus on 04 September, 1951, in Loyola, Spain. He was ordained in Mariampura, Petlad on 25th March 1965. He pronounced his Final Vows on 15 August, 1970 in Jhagadia. May the good Lord grant Fr. Domingo Larumbe eternal rest and may his soul rest in peace. ફાધર લરૂમ્બેએ ઝગડિયા મિશનની શરૂઆત ૧૯૬૭માં કરી ત્યાં ૧૩ વર્ષ સેવા આપી હતી. ૧૯૮૦માં ફાધર લરૂમ્બેએ વિજયનગર મિશન ની શરૂઆત કરી હતી. સ્પેન દેશમાં લોયોલા ખાતે તેઓ ચિર નિંદ્રામાં પોઢી ગયા છે. પ્રભુ તેમને પરમ શાંતિ બક્ષે. ગુર્જરવાણીમાં તેમણે પોતાના જીવનની મહત્વની વાતો અને સેવાકાર્યો વિશે સુંદર વાર્તાલાપ કર્યો હતો.